Gia-Mia Studz Convertible Boots Just $30! PLUS FREE Shipping! You are here: Home / Great Deals / Gia-Mia Studz Convertible Boots Just $30! PLUS FREE Shipping! Wow (I have been saying that a lot lately 🙂 )! Target is having a great sale right now! They have Buy One Get One 60% off select shoes, clothing, and accessories PLUS FREE shipping! Check out this deal on these oh so cute Girl’s Gia-Mia Studz Convertible Boots – they are on sale for $43.99, but when you buy 2 the price drops to just $30.80 each! PLUS FREE shipping! 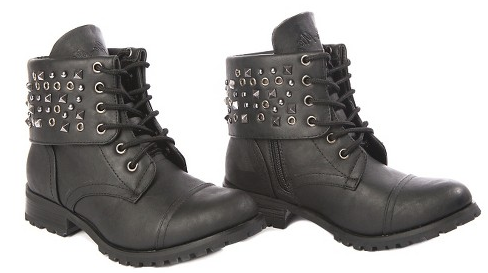 Rock two looks in one with Gia-Mia’s Studz Convertible combat boot! Wear up for a solid look or down for a multi-studded statement! This boot is lightweight and has a flexible non-marking indoor/outdoor sole perfect for the stage or the street. These boots run about 1 size smaller than street shoe so be sure to order one size larger than normal. Half sizes round up!